by e-mail: 8smc4@standa.lt New Software extension for integration with µManager. Please inquire for details. Drivers for Tango will be available soon. Universal motion controller/driver 8SMC4-36 is designed especially to control up to 36 mechatronic systems based on standard DC, Servo or Stepper technologies. The housing of 8SMC4-36 has 7U height and can be mounted in standard 19 inch industrial cabinets. 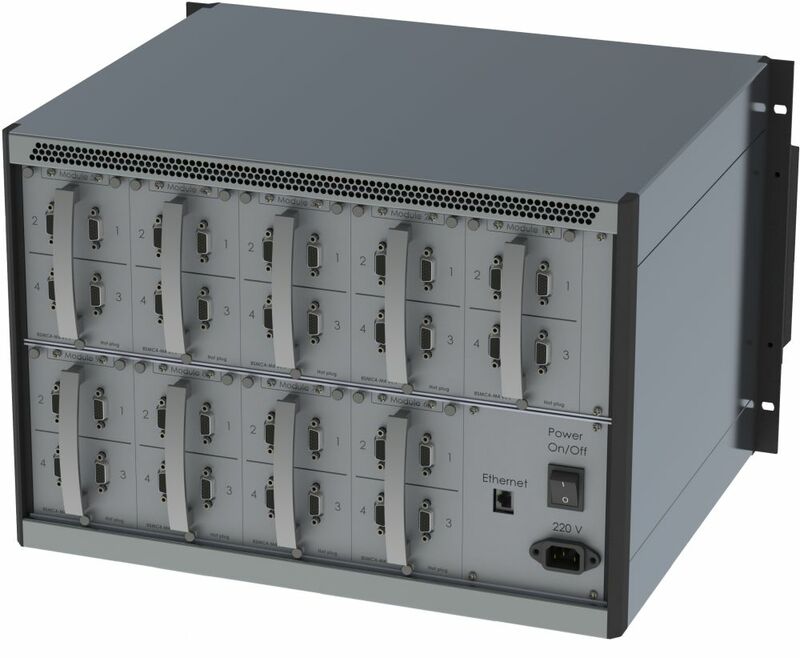 Up to six 8SMC4-36 systems can be installed in a standard 42U 19 inch cabinet. This allows to have 216 axes per cabinet which saves space and lets avoid cable clutter. Up to 250 cabinets (~50000 control channels) can be connected in a single network via Ethernet port. System can be automatically set on a peer-to-peer mode without any special infrastructure or master servers to operate. 8SMC4-36 contains all necessary subsystems, including: control, power units, active cooling systems etc., which support the simultaneous work of all axes. Universal motion controller/driver 8SMC4-36 allows full hot plug. 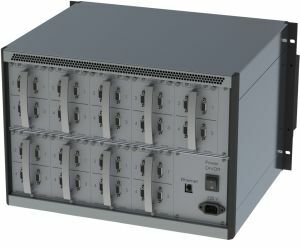 8SMC4-36 can be connected to a number of PC-based workstations via Ethernet. All users have access to the range setting of the available axes and assignment of access privileges. From the programmer’s point of view, working with all axes of the system is very similar to working with a simple 8SMC4-USB box. Needs of the potential clients should be taken into very close consideration when the system is being developed. The system is highly scalable. The number of the axes available for a user and processed by the system can reach 50000, which is the highest number in the industry! As far as a user is concerned, it does not matter how many 8SMC4-USB systems are installed and how they are connected because the user will enjoy a universal interface with an opportunity to control all the axes provided this user has respective access. Front panel contains LED power and status indicators, as well as DB-25 connectors which enables access to remote control and indication functions (joysticks, manual buttons, limit switch indicators, synchronization I/O). The back panel is divided into 9 blocks. Each of them contains four axes (control channels). The blocks are independent; they are located on rails which allows for easy replacement or installation on the fly; minimum number of the 4-channel blocks is 1, and maximum is 9. If the system is expected to work with less than 36 axes, part of the slots can be substituted with plugs to easy updated controller. A power connector and on/off button, as well as an Ethernet port for connection to built-in programmable controller are located on back panel. The system is cooled through grille slots in front and back panels. While in operation the front and the back panels should not be blocked to allow circulation of air. All software supplied with the controller is compatible with Windows 10, Windows 8, Windows 7, Windows Vista, Windows XP, Linux, and Mac OS X (32-bit and 64-bit versions). Controller is delivered with a cross-platform library and examples which allow quick programming on C++, C#, .NET, Delphi, Visual Basic, gcc, Xcode, Matlab, Java, and LabVIEW. The software package also includes XILab user interface, which allows easy access to all motion functions and settings. A scripting language (an EcmaScript dialect) is integrated into XILab, which allows easy sequencing of actions including cycles and conditional breakpoints without compilation and mastering a programming language.